LBC Journey Teams travel to the furthest corners of the world to live out the Gospel message by bringing hope to the hopeless. Whether working at an orphanage in Haiti, helping to build a church in Jamaica, teaching English in Germany, or doing sports camps in the Philippines, or street evangelism in Thailand, the service of these teams leave a lasting impact on the places they visit and the people they meet. Not to mention on the lives of the individual team members. 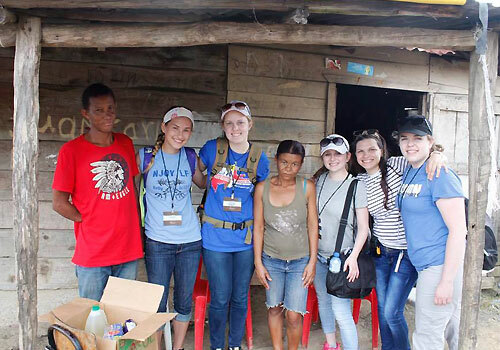 Trips are planned throughout the years and are open to all LBC student to participate. The Journey Teams need two things to be successfully – those who GO and those who GIVE. Is the Lord leading you to GO? Prayerfully and carefully consider if God is asking you to consider joining a Journey Team this year. We’re asking God to put together the teams that HE wants to serve Him around the world. Explore the list of trips below to discover if there is a trip that is of interest to you. Consider ringing in 2019 by taking a trip around the world from December 31-January 11 where you’ll serve, network, and evangelize in a country that is close to LBC’s heart. Lancaster Bible College has deep roots in Uganda with one of our six campuses residing in Kampala, the country’s national and commercial capital. On the trip we’ll help put the finishing touches on an apartment that is nearing completion whose profits will support a Pro-Life Pregnancy Center; we’ll minister to the pregnant mother’s at the Center in need of assistance; and we’ll spend time telling people in the surrounding community about our wonderful savior, Jesus. Please note this trip only has eight spots available for students. Don’t delay and apply today. The Southwest Journey Team will be travelling to New Mexico to serve God in ministry to the Navajo and Zuni reservations. We will be partnering with various mission organizations and churches. Some of the activities include gaining an awareness of the physical and spiritual needs of Native Americans, feeding the homeless, preparing a camp for the summer, and visiting a Christian school. LBC Disaster Relief team to support the relief efforts of Samaritans Purse to a community overwhelmed by hurricane flooding. We will take part in “mud out” or rebuilding tasks based on location, which will be determined by the needs of the organization. Optional areas include: North Carolina, Florida, or a return to Pearland, Texas. Team is limited to 20. The South Africa Journey Team will be working at Aurora Primary School, a Christian boarding school that serves children from the shanty towns of Johannesburg. While at Aurora, we will be assisting the teachers in the classrooms, teaching Bible lessons, and showing God’s love to the children. There will also be an opportunity to travel to Pilanesburg and see the beauty of God’s creation in the game reserve. This trip is a tremendous opportunity for service, but also for personal growth of each team member as well. Have your heart broken as God’s heart is broken for the city. The team will be serving children in the Bronx through the Bronx Bible Church and serving the homeless in Coney Island with Fellowship Baptist Church. The students will be Nobodies telling Everybody the SOMEBODY who can transform Anybody. It will be a life trip where we will learn new things about our God, ourselves and others. Howard Karagheusian Association in Beruit, Lebanon is a health care center that provides medical, social, and psychological services to the local at-risk families and Syrian refugees. Our team will provide support to the center’s children summer school program. We will also have the opportunity to accompany the center’s assessment team for home visits. This journey team is a great opportunity for students that are interested in ministering to refugee families. Even if you do not physically go on a trip, you can still be part of a trip by giving to support a team member. Each individual on a team needs to raise the designated amount for their trip. For some students that is difficult to do. By coming along side them with your gift you are partnering with their team. Staying up-to-date and in step with our Journey Teams’ while they travel across the globe.